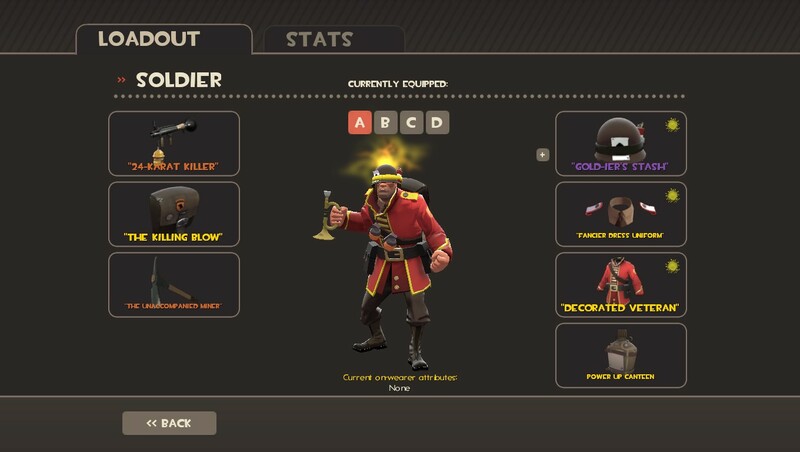 Today, we mourn the loss of our beloved hue-changing beauties, as the TF2 community is forced to return to the world of monochromatic monotony that is normal paint. Spell enthusiasts new and old have had their favorite cosmetic toy taken from them in what could be considered the worst possible way to handle the entire situation (explained further below). My losses include my once painstakingly-perfected Goldier, pictured below, as well as his Festive and Haunted variants meant for such illustrious occasions as the Christmas season (or infrequent snow map), Halloween, and Full Moons. We magic-users have been deceived through silence, Valve’s lack of comment leading us to believe that this year’s festivities would simply fare identically to those of last year’s, and are now suffering the consequences of loving our craft. Some have declared that “those taking advantage of a glitch should expect this”, but I don’t believe this is even remotely accurate, for a myriad of reasons. Valve has clearly shown that they consider TF2’s economy to be of enough importance that they went as far as hiring an actual economist. Therefor, I think it was reasonable to assume that they wouldn’t pull out any drastic changes or item wipes to an item that people were paying upwards of several, several keys for. Each Die Job (a spell that shifts between gold and gray) from the sets shown above (as well as a pair of Teufort Tooth Kickers I’d prepared for the possible event of a third Misc. slot) ran about 7-8 keys apiece, which in my case totaled out to at least 42 keys. The items had already been circulating for a year, and if Valve had gone that long without interfering, why would they suddenly decide to start now? This argument is usually countered with “but they were obviously going to be a recurring item anyway”, but given that the initial expiration date the spells carried specifically mentioned a year-number, it seemed safe to assume that they would be differentiated from whatever batch of spells would be introduced or reintroduced during this year’s Scream Fortress. This doesn’t even hurt those who abused the glitch to make a profit. This here would probably be what bugs me the absolute most. Those of us who went out of our way to acquire these amazing things are being shafted, with our beloved loadouts only showing their true colors a small fraction of the entire year, while those who used them not as a form of art, not as a cool effect to be displayed, but as a tool to turn a profit, have gained their desired wealth and are free to use it as they wish, no matter what state the moon is in. If you hate traders, go on and hate traders. Seriously, some of them ARE absolute scum who would scam you out of an Unusual in a heartbeat if they thought they could get away with it. But don’t go around acting like they’re the ones being punished, when exactly the opposite is true. So, when all is said and done, this could easily be considered one of Valve’s largest mishandlings of a non-issue in the realm of TF2, which, after the mess that was the Crusader’s Crossbow nerf, makes for two rather unsightly changes brought upon us by Scream Fortress 2013. At time of writing, already-acquired Halloween spells have been rendered untradeable, making them unusable to those who hoarded them rather than applied them to items during this Halloween season (in other words, the smart people who were doing what would have landed them permanent paint spells last year), and even paints applied during the interim period between the two periods of spooky splendor, those whose true colors most deserved to be seen on a permanent basis, have been made into Full-Moon-only spectacles that will never see the light of the non-costumed day.